JBL is synonymous with great sounding speakers. The range of JBL speakers is just awesome and the sound quality of the speaker is amazing. JBL charge 2+ is an updated version of the precious charge speaker. For the price, this one is simply amazing. Its compact and it does what it truly says. It delivers excellent sound performance without any hiccups. What sets this speaker apart from other speakers in this range is. It’s waterproof and it has a solid battery life. A good battery life is the most important feature for a speaker, there is no major change in design and the shape is cylindrical just like other JBL speakers. The speaker has a passive radiator that gives an amazing audio performance. Even if you hear your music on loud volume, the sound is clear and crisp. JBL Flip 4 gets an edge with stereo speakers that are missing in JBL Charge 2 Plus. But JBL Charge 2+ speaker doesn’t really disappoint you in the sound department. The speaker is splash proof and weatherproof. Just like JBL Charge 3, you can carry this speaker along while traveling without the need to worry about the weather. The wireless streaming and connectivity of this speaker are simply amazing. It has a built-in speakerphone that lets you take calls on the go. With the speaker, you can also enjoy great integration with other devices. If you love to socialize, then this speaker is for you. This app integrates with all the social features to give you an easy access to your music. You can connect up to three different music sources with the application. You can play your music loudly with different speakers and setup. You can also listen to your music through app integration. It also lets you take all your calls with the touch of a button. The speakerphone mode gives you easy access and saves your time. It’s a perfect companion for your traveling too. It lets you play your music loudly at a pool party. You can also dance in the rain with your favorite rain tracks. It will let you enjoy so much so that you never miss any beat or any moment of your life. You must buy a JBL Charge 2+ speaker for its pure music performance. The class-leading bass response can enhance your music experience, as no other speaker would do. It’s clear and crisp audio will surely blow your mind. The battery life of the speaker is also good so this is like an added advantage of the speaker. It’s a complete feature packed speaker and you will surely enjoy playing this one. There are many great features of the JBL Charge 2+ speaker, let us look at some of them. JBL Charge 2+ speaker has a wireless Bluetooth streaming. It helps to deliver high-quality stereo sound from your phone or tablet. The sound is just amazing and voice clarity is also good. The speaker features build in rechargeable battery. It gives you 12 hours of playback time, which is actually good according to price. You can charge the battery through USB sources or a single port. The speaker features an in-built speakerphone that lets you make or receive calls without any problem. With one touch of a button, you can receive calls. You can also use echo cancellation feature to enhance the clarity of your calls. JBL Charge 2+ speaker is splash proof and weatherproof. You can use the speaker for your pool parties or even in the rain. However, it’s not completely waterproof. If you submerge the speaker in water, then sound quality can get affected. There is a social mode in the speaker that lets you connect and integrate with other Bluetooth devices. It can connect up to three different music sources and charge 2 + speaker to give you an amazing music experience. The speaker has a JBL bass radiator and dual external passive radiators. The sound is powerful and sharp because of these radiators. The speaker though looks heavy is not that heavy. In fact, being portable you can carry the speaker wherever you go. It’s perfect for your traveling needs as well. JBL Charge 2+ speaker has a very rich and expressive sound with sturdy build quality. Even if you drop the speaker, it will not affect the sound performance. The connectivity of the speaker is amazing. There are no hiccups in the Bluetooth connectivity of the speaker as well. It connects and pairs with every Bluetooth device to give you a great experience. The control and buttons on the speaker are easy to operate. The overall interface of the speaker is good. The speaker also features a crystal white LED that gives an edge over other speakers. 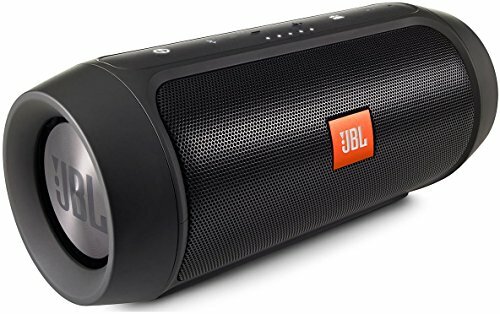 JBL Charge 2+ speaker has the same design as previous speakers of JBL. Its cylindrical in shape with no change at all. The only thing that has changed is the JBL logo that features in the front. The build quality of the speaker is quite rugged and it’s sturdy too. Even if you drop the speaker, it won’t affect the audio quality. The controls are clear and the overall interface is clean. The speaker also has LED illuminated volume control feature that gives you easy access and control. The design and build both are good for the price. The neat buttons add to the look of this amazing speaker. JBL Charge 2+ speaker features dual external passive bass radiators. You can not only feel the bass but also experience it in its full capacity. The sound quality of this speaker is amazing. If you compare it with other speakers in this range, then this one wins hands down. It has a good mid-range and there is no distortion. It maintains the audio quality in the higher range too. Even if you hear your music loud in full volume, there won’t be any problem with the audio. Even if you connect the speaker to different devices, the sound quality is clear and crisp. It gives you a great music experience. The setup of JBL Charge 2+ speaker is pretty much the same if you compare it with other JBL speakers. The buttons and controls feature on the top. You can play and change the music tracks with the help of these buttons. A LED light tells you about the status of charging. The power buttons and controls are easy to operate and the interface is clean. You can also use the speaker for your pool parties or in-house parties because of its easy setup. As its splash proof and weatherproof, you can enjoy your music on the go. Performance of JBL Charge 2+ speaker is much better and improved than JBL charge 2. The speaker is compact in size but gives an ultimate booming sound. In fact, the bass is so good that it does not distort even in the high range. It gives good music experience with every music genre. The midrange is great and lows are also crisp. It gives you an awesome music experience. The speaker is compatible with almost all the music devices. In fact, it’s also compatible with other JBL speakers. You can integrate it with other speakers to get an enhanced sound and audio quality. The battery performance of the speaker is not superlative but good for the price. On a full charge, it gives you 12 hours of playback time, which is actually good. You can also charge the speaker on the go with other USB resources available. The battery life is good even if you connect the speaker with Bluetooth or other wireless devices. The connectivity of the speaker is also good. It gives you an amazing wireless Bluetooth streaming through which you can hear your music loud and clear. The social mode lets you connect up to three different sources at a time. You will never miss on your favorite beat with the connection of the speaker. It has a rich sound quality. So many speakers out there offer great sound quality, but this one truly shines. The design is simple and built quality is sturdy. The sound performance is truly amazing and there is no disturbance even if you play the speaker on full volume. It is also splash proof so you can carry the speaker along with you even when you travel. The speaker is popular for its audio and you won’t be disappointed with this speaker. The speaker has built-in speaker capabilities that stand out. JBL charge 2 + is a well-equipped speaker with some amazing features. You cannot really miss this one if you a true music fanatic. The bold sonic sound is simply amazing and you can play your music loud with its super bass base. It’s a good sounding speaker for the price.